Does anybody know that it's possible to create multiple Simplenote databases? This is incredibly handy if you're using it to route notes into different Tinderbox documents. I'm using an application called "SwitchUp" that allows one to create multi-user profiles on a per-application basis. I can't find any info on 'SwitchUp' so aren't totally sure how it fits here. Tinderbox syncs with Simplenote and assumes a single account per user and thus has a single sync folder. If you want to link Tinderbox with multiple Simplenote accounts you are best off to use a different TBX document for each Simplenote account as the account settings for the latter are stored as part of document settings. I hope that helps. If not I'd contact support directly as I don't recall this sort of use being mentioned before. Thus it is likely, in effect, a feature request. In which case it might be a good idea to drop an email to Eastgate explaining you use case/need in this regard. I send specific notes from simplenote into a range of different tinderbox files; just use tags in simplenote and ask your tinderbox document to only sync notes with the correct tag. 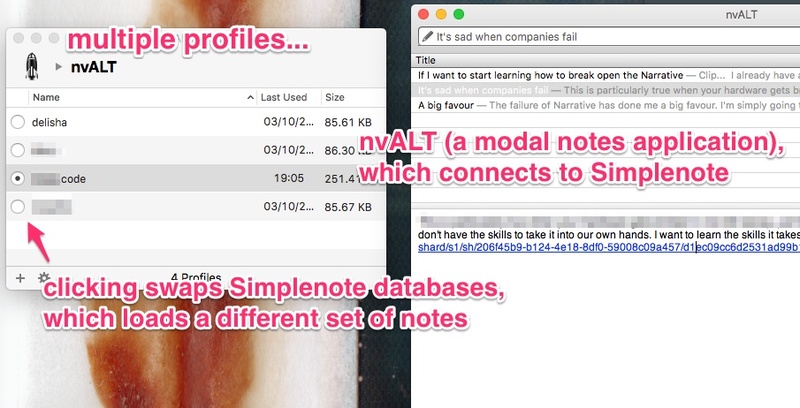 Simplenote has a Mac app (and several compatible ones) - a better way to get notes in if not working directly in Tinderbox. While it's possible keep everything in a single Simplenote database, tagging notes to allow them to sync to different documents, it's not the only approach. Different databases provide different views - one could be notes about the office job; another, notes about West African sculpture. They don't necessarily mix and having a clean focus is of value. SwitchUp http://www.irradiatedsoftware.com/switchup/ (it's not being actively developed) allows the creation of multiple profiles for Simplenote, so I can switch between them. I have different Tinderbox documents for things that don't mix well. This approach helps me to reduce complexity at the note-taking stage, enabling the processing to be done later on.